Google Maps made it into the update cycle this week, bumping the version number up to 9.39. This update appears to be a bit lighter than many from the last few months, but it’s not completely lacking improvements. There’s a new shortcut that can be used to jump directly into the traffic screen. A quick teardown also reveals a potential improvement to the busyness chart on many locations. As always, we’ve got a link below to pick up the APK. 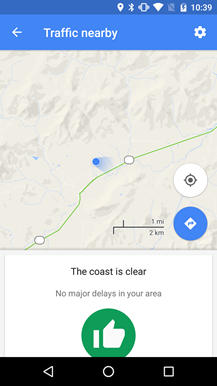 Thanks to the millions of active smartphones roaming around the planet at any given time, Google is able to create a fairly accurate image of what traffic conditions are like. 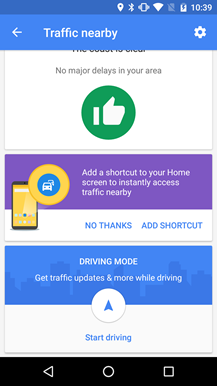 A few weeks back, Google added a new notification to warn users about potential traffic issues before they get on the road, linking it to a screen with a map with the current traffic situation. If that notification wasn’t quite timely enough, the new version of Maps introduces a more consistent way to get back to that screen at any time with a handy shortcut for your homescreen. There are two ways to add the shortcut to your homescreen. To begin with, it’s located in the regular widget/shortcut list, so there’s no need to even open the Maps app to track it down, unlike the Timeline shortcut (for no obvious reason). 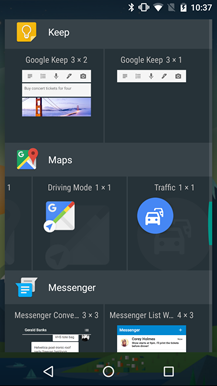 If you end up on the traffic screen through the notification, you can also drag the card upward to find a suggestion to add the shortcut. Disclaimer: Teardowns are based on evidence found inside of apks (Android’s application package) and are necessarily speculative and usually based on incomplete information. It’s possible that the guesses made here are totally and completely wrong. Even when predictions are correct, there is always a chance that plans could change or may be canceled entirely. Much like rumors, nothing is certain until it’s officially announced and released.The features discussed below are probably not live yet, or may only be live for a small percentage of users. Unless stated otherwise, don’t expect to see these features if you install the apk. Left: current view in Maps. Right: live data from dogfood version of Google Search. 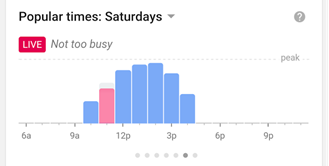 The scale showing popular times can be a handy way to figure out if you’re about to walk into a restaurant or other public location and find it packed to the brim with people. However, the scale can occasionally be misleading, especially if there are special events, recent changes, or some other factor that’s either driving people to the same place, or possible away from it. If you’re really trying to judge how full a place is before walking in the door, you really need up-to-date information… And that’s exactly what Google Maps has in store. It’s really no surprise this feature is coming, the same thing recently turned up in a dogfood version of the web interface for Google Search. There’s not much to look at for evidence – just a single string – but as the screenshot above shows, it doesn’t take much to make the confirmation. The line is named busyness_live, which shares the same busyness prefix found in the other strings used with the popular times chart. It’s safe to assume the two charts will look the same, given that the two versions are generally identical.